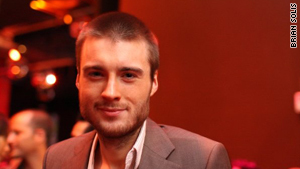 Mashable's Pete Cashmore says Web sites should not charge for their content. Cashmore: The move "may nonetheless be declared an economic success"
London, England (CNN) -- The New York Times announced this week that it plans to introduce a payment model for its Web site in 2011. The reaction has been mixed: Many readers, accustomed to reading The Times for free, say they simply won't pay. Proponents, meanwhile, argue that ad revenues won't sustain the quality journalism the New York Times aspires to produce. If you want quality, you'll need to open your wallet, they insist. Those proponents are stuck in the past, I think -- they're focused on upholding existing cost structures rather than innovating to maintain quality while reducing costs. To argue that great content necessitates expense is to ignore the new efficiencies enabled by the Web. The Times' plan is arguably the least risky of the various payment models available: The site seeks to introduce "metered" payments, where readers could view a select number of pages per month for free, after which they'd need to pay. This means that for most drive-by readers, the move will have no effect; only regular visitors will hit a subscription page. The Times could turn this dial up or down depending on performance, creating an optimal model. Even this nuanced approach to paid content is at odds with the Web economy, however. Web sites trade links as currency, pointing readers' attention to valuable content. Meanwhile, a network of independent curators has sprung up on sites like Twitter and Facebook, directing those valuable clicks to handpicked sources. By creating uncertainty about whether those links will work for all visitors (readers might have used up their metered allowance for the month), The Times will dissuade the sharing of links on blogs and social networks. Popular blogs like ours will seek out other sources to link to, concerned about directing readers to inaccessible pages. The move may nonetheless be declared an economic success: I can imagine a scenario in which The Times is able to tweak the model such that revenues do indeed climb. But the gamble will inevitably limit The Times' reach, leaving an open door for new media companies to prosper. To understand the threat to the old guard, look at how blogs were able to inflict a million tiny cuts on the publishing industry. The digital natives building these new media companies leverage online distribution -- virtually free, and getting cheaper -- to compete with the huge overheads of the printed page. The software they use is free. They use distributed teams, eliminating the cost of office space. They remove the need for marketing budgets by leveraging their own readers as marketers, spreading the word on social networking sites. Bloggers, starting out with minuscule budgets, were forced to be resourceful in their approach to content creation. Newspapers, coddled by limited competition (not everyone can afford a printing press), were not. Some would argue that bloggers produce lower quality content as a result. I disagree. The gadget coverage I read on Engadget is more comprehensive than The Times' tech section. Specialized publications are able to dig deeper because they concentrate their resources on a single area of focus rather than going broad. Gadget blogs like Boy Genius Report and AppleInsider are famous for their scoops, too. Blogs are not mere content factories, as detractors would have you believe. Quality journalism on a shoestring? My point: Just as new media companies mastered the basics of content creation on a shoestring, over time we'll develop new approaches to creating the expensive stuff for less. Journalism is an extremely costly process when sending reporters to every corner of the globe. But why maintain that expense when citizen reporters on the ground can gather the source materials with their camera phones and laptops, sending it back to experienced editors to be curated and contextualized? Likewise, investigative reporting is extremely costly until media companies realize that every one of their readers is now a reporter: In aggregate, the audience is more knowledgeable than the publication itself. By limiting access, The Times will reduce its influence and reach. What's more, by upholding the notion that quality journalism necessitates high costs, they leave an open door for those who believe they can create quality content for less. The opinions expressed in this column are solely those of Pete Cashmore.